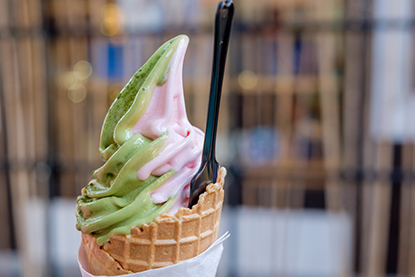 Explore San Francisco’s Japantown! This six-block district is known for its sushi, traditional massage, shopping and Japanese culture highlights! Visit in April for the annual Cherry Blossom festival, or visit any day of the year for a taste of authentic Japanese Tea. Located on Post Street, Japantown is a unique cultural destination that every visitor should see. Muni Lines 2, 3, 22, 38, and 38L stop at Japan Center. Muni line 38 allows easy access to Japantown from Union Square and Market Street. A parking garage is located directly across the street from Japan Center on the 1700 block of Post Street, as well as on Geary Boulevard. The commercial area of Japantown includes Japan Center, the shopping mall complex located on Post Street. This Japanese-oriented shopping mall is comprised of Kinokuniya Mall, Kintetsu Mall, and Miyako Mall. Miyako and Kintetsu Malls are separated by the Peace Plaza, which contains the Peace Pagoda. Kintetsu Mall connects to Kinokuniya Mall via a hall between the two buildings. The AMC Kabuki 8 Theatre is located behind Kinokuniya Hall on Post Street. Japantown is incredibly pedestrian-friendly. Pedestrian bridges cross Geary Street, allowing locals and tourists easy access from multiple points up and down the street. The malls are between Geary and Post, making all buildings safe and easy to access for visitors on foot. AMC Dine-in Kabuki 8: The MacGuffins Bar on the top floor of this theatre only admits patrons 21 and over, since they sell alcohol. The ticket is pricier than chain-theatre alternatives, but the custom seating and movie selection make it worth it. Peace Pagoda: This 5-tier concrete pagoda was designed by Japanese architect Yoshiro Taniguchi and presented by San Francisco’s sister city, Osaka, to the people of San Francisco as a gesture of peace. The pagoda itself is a symbol of peace for all who visit the area and is designed to draw people together from all cultures and religions. Pika-Pika: Picture booths are all the rage in Japan, where school kids crowd into small booths and take group pictures together. What makes these photo booths special is their ability to add custom graphics to the picture! Take a picture of your group and add stars, hearts, bubbles, text, and more! These prints are personalized and are one-of-a-kind. Pika-Pika offers different booths that create different effects and vary in price. Each booth allows the user to take multiple photos to select the best ones. Prints are available in sticker sizes, or as large full-page photographs. Sophie’s Crepes: Located in Kintetsu Mall, this delightful crepe shop creates cute, stylized crepes. Visitors may walk away with a panda face, a star, or cute figure drawn on their crepe. Kinokuniya Bookstore: This unique bookstore sells Japanese magazines, books, CDs, manga, and more! Available both in Japanese (on the upper floor) and English (on the lower level,) there are enough books and other materials to satisfy any craving for Japanese culture. Visitors will also find anime figurines, plushies, and Japanese candy for sale here. It is rare to find such a large collection of Japanese products; fans would do well to stop by on their visit to San Francisco. Cherry Blossom Festival: This annual festival highlights Japanese culture through flower-arranging demonstrations, calligraphy, orimami, bonzai gardens, Taiko Drumming and more before the festival culminates in a spectacular parade. Spectators pack the Peace Plaza to watch the parade and participate in this timeless Japanese tradition. Union Square: Visit San Francisco’s #1 shopping destination! With over 500 restaurants, retail, electronic, and music shops, Union Square offers hours of shopping and will provide something for every person in your group. The Presidio: Come visit the Presidio! Golf, wade in the ocean, hike, bicycle, climb a rock wall, go bowling, jump on trampolines at the House of Air, or peruse the Walt Disney Family Museum. This 1,491 acre National Park offers forest scenery, wide open spaces, and more! Here you can find an activity for every member of the family. Alamo Square: Pose for pictures against the backdrop of the San Francisco skyline and the Painted Ladies! Featured in the opening credits of the TV series Full House, the Painted Ladies consist of five beautiful Victorian homes facing Alamo Square. The square offers 12.7 acres of open space for a picnic, a nap, or a variety of other activities.